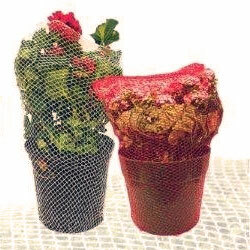 Soft knitted, small mesh netting that gently encases fresh plants. Allows for more containers per shipment. Plants get air, light, and water if necessary without destroying the sleeve. Sizes from 4″ to 14″ diameters. Heat sealable, eliminates metal or sewn closures. Soft knitted, small mesh netting in sizes to accommodate any plug tray. Not only effective against damage claims, but adds eye-catching color to the tray. Colors can be used for color-coding sizes, varieties, pricing, etc. Heat seal-able to eliminate metal or other types of closures. Made of super-strong polypropylene yarn, then soft knitted to make the netting even stronger. Firewood Netting can be used to package small bundles of firewood. 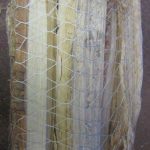 Netting allows the wood to breathe and dry out; will not retain moisture as does plastic wrap. A baler is available for easy loading and packaging. Cost is between .015 - .02 per foot depending on size and quantity.